So like everyone else, I spent Sunday evening watching the final episode of season four of “Downton Abbey” and here’s what I don’t understand; with the American public so obsessed with the manners of the British aristocracy of a past century, why am I seeing such appalling table manners everywhere? In almost every episode the Downtonians are seen at a fully laid table, eating and conversing, using an array of implements, linen and serving pieces. We’re glued to our sets as Lord and Lady Grantham, Mary, Edith and Mr. Branson come down to dinner in formal dress. We watch as footmen serve to the left and clear from the right. (In case you’re wondering, it’s because, assuming you are right handed, it’s easier to serve oneself from a dish offered on the left). But HAVE YOU BEEN IN A RESTAURANT LATELY? Honestly, I’m feeling like the Dowager Countess in my despair at the lack of simple manners. The world was a cruel place then, as now, but a little refinement could make it seem a bit more pleasant. With just a little etiquette we could bring Highclere Castle to iHop. When I was growing up it was still the era of the family dinner table. Granted, due to my mother’s practically Edwardian Scottish upbringing, ours was, perhaps, a bit more formal than most. But I can tell you, it has stood me in good stead. “No uncooked joints on the table,” she would say in her Mrs. Hughes brogue. I know how to eat soup politely. I know which fork to use. I know what to do with my napkin (and blowing my nose isn’t among the options). I was actually at dinner not long ago in a fine restaurant with a forty-something man who blew his nose in a linen napkin, balled it up and then threw it on the floor. You heard me. I don’t wish to be called Miss or Ma’am but do I really need to be called “guy”? You guys. This from someone invariably much younger than myself who would get a bigger tip by simply saying “May I take your order?” And in my family we were taught to speak softly in public places, be it a restaurant, a train or plane, a hotel corridor. Our conversation was never to intrude on other diners, travelers or guests. I don’t know about you, but I find that half the time I can’t even hear my dinner companion because the people at the next table are shouting at the top of their lungs. The other night I actually was treated to the excruciatingly vivid details of someone’s surgery. This, as I’m about to order my meal. And don’t even get me started on the smart phone use. 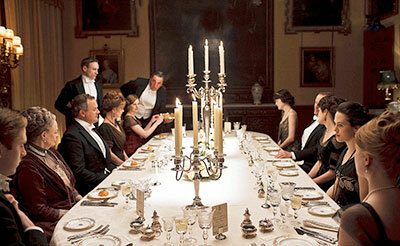 Can you imagine everyone sitting down to the table at Downton and then pulling out their smart phones? Of course not. We’d miss all that pithy dialogue. And isn’t that what sit-down meals are about? If it’s only the food, we might as well just pull up to a trough. And based on the way I’ve seen parents whip out the ol’ iPhone and plop it in front of their children, instead of making a restaurant experience a teaching moment, it won’t be long before that’s what we’ll be doing. Why waste time with that cumbersome cutlery when you can just stick your head in a bucket? I know, I know, I positively get the vapors about this, but young ladies, especially! Do you aspire to being a drill sergeant? If not then there is no reason to be talking at an earsplitting volume while you are sharing a meal with your Lord Gillingham. A little mystery is more desirable. Make him lean in. And men, do you need to put your foot up on that extra chair at the table. Does anyone really want your shoe that much closer to her dinner plate? Of course I realize that the world is a much more casual place now, and I’m all for it, believe me. I’ve no desire to go back to the days of repressed feminism and repressive corsets. But good manners are really just about being courteous to others, and not just the others with whom you are acquainted. Sure, everyone has the right to do as he or she pleases, but wouldn’t the world be a good place if everyone considered the quality of someone else’s life? It’d be very good, M’Lady. “No uncooked joints on the table?” That’s hysterical. Although, I have noticed how you eat soup so politely. Keep your posts coming. Love them. Well done Helena!!!! And, kudos to all those well-groomed and elegant servers who deliver manners table-side (they are permanently etched in my memory bank like the mouth watering memories that still linger). Ahhhh….a well mannered and server extraordinaire adds to the drama and the delight of fine dining. Ugghhh!! So sorry to hear that! Yes, unfortunately all you can do is take your business elsewhere. But I would make a phone call to the owner and tell her why. Thanks for writing! Helena, shortly after reading this blog, I was at a hip little Italian restaurant dining at the bar with my husband. Across the bar sat two gentlemen in suits and across from them was a small group of grey haired guys who thought they were at the bar at Ralph’s. The loud guys engaged the suited guys in an obnoxiously loud, guffawing, shouting match across the bar…about sports, of course. Remember, this is a little, cozy bar. The rest of us dining at the bar stared, covered our ears, shook our heads, shushed them,…none of it worked. The waitress asked them to take it down a notch. Didn’t work. We complained to owner of the restaurant,who was in the house, and she basically ignored our request. Apparently, the loud guys are twice weekly patrons and big spenders (according to the waitress). So, we had a terrible experience at one of our favorite places. I’m not sure I’ll be going back there any time soon.